All of this means that you save money because you won’t need to clean your carpet as often. Fewer cleanings means better bang for your buck and one less thing to worry about. You may have seen the same stains reappear time and time again. You scrub them, or rent a carpet cleaning machine, or even have a steam cleaning carpet cleaner come and clean them for you, and yet a few days later they reappear, almost like magic. The problem here is that the stains weren’t actually removed in the first place. When you scrub or steam clean stains, what actually often happens is that the stain is pushed deeper into the carpet fibers. You can’t see it during the cleaning, but as the carpet dries, the stain is wicked back up to the surface. Plus, soapy cleaning solutions can leave behind a sticky residue that just attracts more dirt and grime to the same spot, making it worse instead of better. 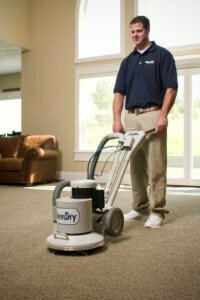 Through the use of carbonated carpet cleaner, San Juan County Chem-Dry thoroughly removes stains quickly and efficiently. Our carbonated cleaner works from the bottom to eliminate stains, instead of driving stains deeper into the carpet only to crop up again later. However, if a spot does reappear, we will work until the problem is solved! We want you to be completely satisfied with your carpet cleaning!